Finally finally we got the tomatoes in the ground today. Gosh it has been a struggle to get the garden going this year. Planting the tomatoes is a major milestone, though. Alice and I have developed a technique that works very well for us. I haul the water in buckets from the pond and stage them near the scene of operations. Then, using a spade, I dig 4 deep holes in a row. As I’m digging them, Alice follows with the watering can, and fills the holes about half full of water. Then she lays out the plants for me. I tap them out of their pots and put them as deep as I can into the muddy hole. Then I pull the surrounding dirt in, and after the hole is all filled in, I sculpt the dirt into a basin around the plant so the water won’t run off when I water the plants. The tomato cage gets poked into the ground next. I then open a bag of leaves I’ve been stockpiling, and mulch heavily around each plant. Then on to the next plant. Astute readers among you might notice a trend in the jobs we each pick to get the tomatoes planted. To give you a hint, Alice walked out of the greenhouse without a speck of dirt on her, or the smell of dirt on her. I, on the other had, had dirt spots from head to toe. My fingers were on my hands, I was sure, but they were not visible under the dirt. Dirty fingernails? Hah! You couldn’t even *see* my fingernails. This is no complaint on my part. Alice staged everything I needed so I didn’t have to get up until a row of 4 plants was completed. And, by golly, I like getting into the dirt; while Alice doesn’t. We both do the part of the job we like, and we get the job done between us. This entry was posted on Wednesday, June 12th, 2013 at 9:17 pm and is filed under Uncategorized. You can follow any responses to this entry through the RSS 2.0 feed. You can leave a response, or trackback from your own site. Looks like Alice is doing ALL the work … LOL !!.. Yes, I see what you mean. 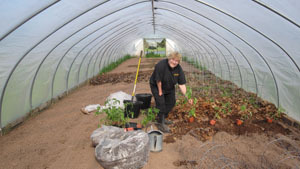 Alice proudly pointing at out precocious little tomatoes! The transplanting seems to have gone well. It is warm in the greenhouse, and the plants’ feet are warm and wet, which is heaven for a tomato plant.